Who was Myron Haliburton Avery? The first 2000-miler of the Appalachian Trail. The Appalachian Trail Conference’s chairman from 1931 until his death in 1952. Chronicler of North Lubec history and extensive writer on mountains and trails. 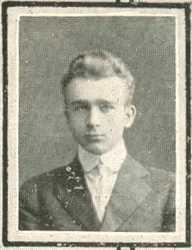 Born in North Lubec on November 3, 1899, Myron was son of Haliburton and Myra Bither Avery. A North Lubec class photo, Myron in front row, third from left. Use the zoom tool for a closeup. Attending North Lubec Elementary school, later Avery commuted to high school in Lubec’s village, class of 1916. The first ever Quoddy Light yearbook forecast a political career, the Class Prophecy portraying Myron as a judge who “evidently followed the profession of his heart.” Class President and 1916 Valedictorian, Avery did become a lawyer with a career in government service. (Inexplicably, both the Yearbook and the Commencement Program reproduce his middle name as “Halburton,” without the letter i). After Myron Haliburton Avery graduated from Bowdoin College he attended Harvard Law school, then practiced Admiralty Law with the U.S. Navy. Avery also served in World War II, returning to inactive duty after five and a half years of service with the rank of Captain and the Legion of Merit. Based mostly in Washington, D.C. during peacetime, he also served as president of the Potomac Appalachian Trail Club from 1927 to 1941. During these years he hiked the then-new Appalachian Trail at every opportunity. As a native he proposed extension of the trail’s terminus into Maine. David Field of the Maine Appalachian Trail Club wrote that “Avery also was very keen on having the Katahdin area designated as a national park and he did a great deal of research and made numerous trips to photograph features of the area.” With his oft-present measuring wheel Avery explored the route. 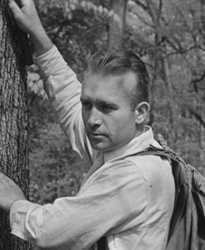 Steve Clark, past president of the Maine organization and also guidebook editor for 18 years, wrote that Avery long edited the many Guide books all up and down the Appalachian Trail, even into Georgia. The Maine club’s collection includes all editions for the Guide which he authored from 1935 to 1952. 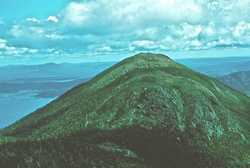 Soon after Avery’s untimely death on July 26, 1952, an act of the Maine Legislature renamed East Peak on Bigelow Mountain as Myron Avery Peak. An abandoned fire tower remained when this photo was taken. 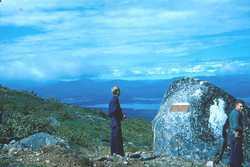 A boulder on Avery Peak commemorates the man.